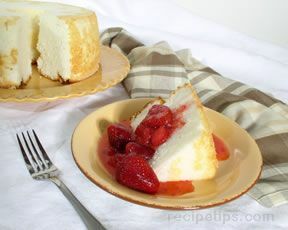 Sweet, airy, and delicate, this white sponge cake goes particularly well with a fresh berry sauce. Preheat oven to 350º F. Do not grease the tube pan. Sift flour and 3/4 cup of sugar together, set aside in a small bowl. In a large bowl, beat together egg whites, cream of tartar, and salt until the mixture becomes foamy. Gradually add 3/4 cup of sugar in small amounts while continuing to beat the egg whites until they form soft peaks. Add the vanilla and almond extract and continue beating until the meringue holds stiff peaks. Gently fold in the flour and sugar combination until just combined. Pour batter into ungreased tube pan. Gently run a spatula through the batter to prevent large air pockets from forming. Bake 35 to 40 minutes. Remove from oven and immediately invert pan on a rack or a bottle for 1 to 1-1/2 hours to cool completely. Cut carefully around the sides of the cake to remove. Garnish as desired.